This is one of my favorite photographs I’ve stumbled upon in a long while. 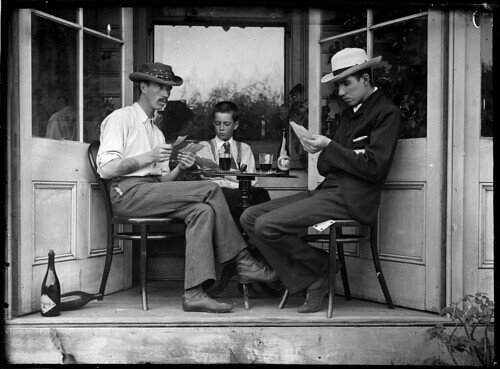 I love the faces on the three card players, especially the one on the left who is actually studying the face of the one on the right looking for tells. The clothing, the pre-teen boy who seems to also be playing, the drinks on the table, the four of clubs underneath the leg of the guy on the right… I just love this picture. It’s actually my desktop wallpaper at the moment. The photographer of this is unknown, but the image was placed in the public domain by the estate of Raymond Phillips. When I read the political and social and financial views I held fifteen years ago, I actually cringe. A person who changes his or her mind with sound reasons for doing so is a person who is thinking and trying to understand the world around him or her. That’s something to be respected. 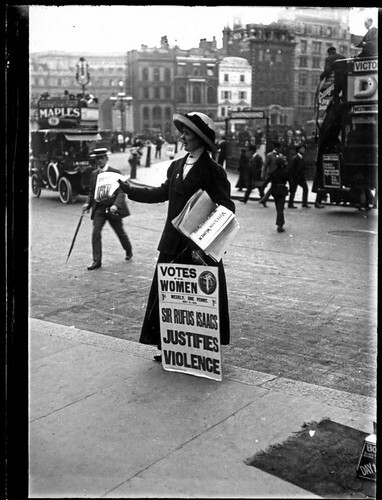 I’ve been reading about the suffrage movement of the early 1900s recently. I am thoroughly amazed at the bravery of the women involved and awestruck at the abuse they took for attempting to secure the right to vote. This was a powerful time in American history. This picture was donated to the public domain by George Eastman. Whenever you believe in something and want to share it with others, the best route you can possibly take is to assume that the person you’re trying to convince thinks your idea is basically insane and somewhat questions your sanity because of it. If you just come at them loudly with what you believe, you’re going to push them further away and convince them that your idea is crazier (and that you are, too). If you want to advocate for your beliefs, live them in the least judgmental and least pushy way possible. You influence people by your good deeds, then when they come to you to understand what you believe, your beliefs will have much more sway with them. Just turn this on in the background and go about your day. This music will lift you up. We love having movie nights where we invite over some people and watch a movie or two. The problem with that is that sometimes it’s really hard to find a consensus movie to watch. Foundd solves that problem. All you do is log on with the friends you’re going to have over, then each of you rate a few movies. Foundd takes those ratings together and collectively suggests films for you to watch together. It works really well. What can I do right now to ensure that future generations have more opportunities than I had? I think that’s a question everyone should ask themselves. It’s something that humankind has thought about for a very long time, but sometimes I worry that question isn’t being addressed today. We can’t control what happens to us, but we can control how we respond. Your response is what makes you the person that you are. I am fascinated with the idea of games being used to improve your life through the consequences of play. Jane McGonigal offers a wonderful summary of how this works. Every time I read about or hear about these ideas, my brain starts churning. This song has always given me chills.